Vancouver, BC, April 16, 2019, MAX RESOURCE CORP. (TSXV: MXR) (OTC: MXROF) (FSE:M1D1) (“MAX” or the “Company”) is pleased to report surface assay results from its ongoing exploration on the Company’s 1,757 sq. km “Choco Gold and Platinum Project”, located 100km SW of Medellin, Colombia. The concentrates of sample 001 graded 340.84 g/t gold and 111.03 g/t platinum and sample 002 graded 222.06 g/t gold and 113.83 g/t platinum, both samples were located within the 1,000 sq. km exploration zone (refer to location map). Sampling detail can be found in the accompanying table. Further analytical results will be reported as received. Production figures the 8 districts: Upper San Juan, Condoto Flats, Condoto Big Flat, Bebedo, Liorento, Cajon, El Tamana & Bajo Tamana a resourced from R.J.Fletcher & Associates (2011) Review of Gold and Platinum Exploration & production in Choco Province, Colombia. Part 3. Private Report for Condoto Platinum Ltd. Sample 001 and 002 were taken from surface within the same area as the hard rock conglomerate. The gold and platinum are of a coarser nature than the finer gold in the conglomerate. Test work is on-going on the conglomerate samples, with analytical procedure focused on optimal recovery of the fine gold. 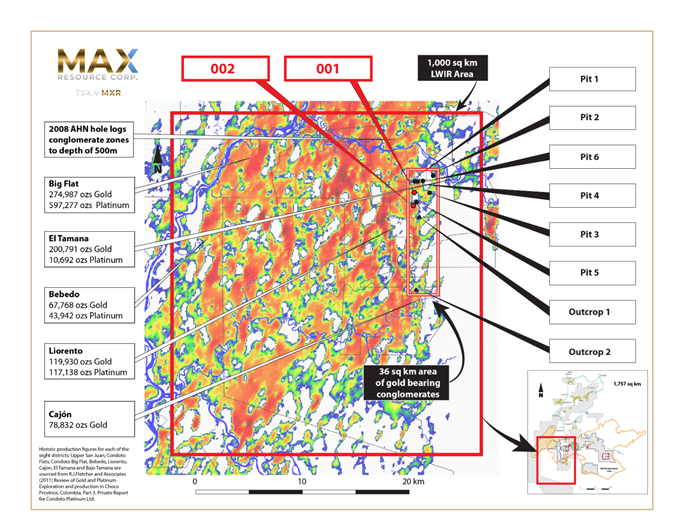 MAX’s on-going exploration will continue to target enrichment zones within and outside the current 1,000 sq. km exploration area. Sampling of conglomerates and overlying surface deposits will continue to locate zones of gold enrichment within the conglomerates. The Company also continues to review and explore additional areas with the 1,757 sq. km Choco Gold and Platinum Project. * Sample grade is partial as the gold and platinum content of the tailings has not been determined. MAX continues to work with the CIMEX Mineral Institute at the Medellin Mines Faculty of the National University of Colombia (CIMEX) in Medellin. CIMEX is independent of MAX and carries out all of the processing and testing of the samples. The surface samples are delivered to the CIMEX. Each sample is panned to concentrate by MAX’s Colombian specialist panner under the direct supervision of CIMEX personnel. The entire sample is first weighed, then panned. The resulting concentrate is photographed, dried, weighed and then analyzed at CIMEX. The entire concentrate is leached in aqua regia for 48 hours to dissolve the gold and platinum. The leachate is then analyzed on an atomic absorption mass spectrometer for gold and platinum. The tailings of the concentrate from the leaching process are fire assayed in their entirety with the resulting button dissolved by aqua regia and analyzed on the atomic absorption mass spectrometer for gold and platinum. The final gold and platinum values for the concentrates are calculated utilizing the leachate and fire assay values. CIMEX is currently in the audit process to receive its ISO certification. MAX is a mineral exploration company focused on the development and acquisition of prospective projects in the rich mineral belts of Colombia. The Company has established significant exploration infrastructure and local community support for the Choco Gold and Platinum Project, located 100 km south of Medellin, which covers or is adjacent to historic production of 1.5Mozs gold and 1.0Mozs platinum. The Company’s Gachala Copper Project, is located 60 km east of Bogota. The Company is led by a seasoned management team with a track record of significant discovery and exploration success. Tim Henneberry, PGeo (British Columbia), a member of the Max Resource advisory board, is the qualified person who has reviewed and approved the technical content of this news release on behalf of the company.